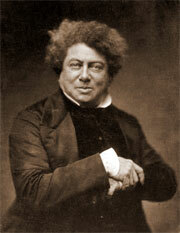 The Three Musketeers (Les Trois Mousquetaires) is a novel by Alexandre Dumas, pre. 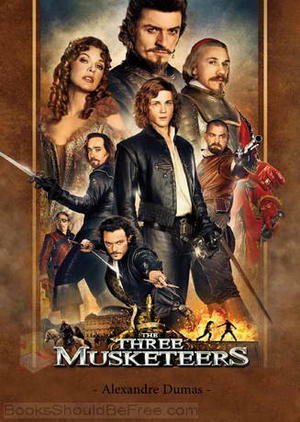 It recounts the adventures of a young man named dArtagnan after he leaves home to become a musketeer. DArtagnan is not one of the musketeers of the title; those are his friends Athos, Porthos, and Aramis inseparable friends who live by the motto, One for all, and all for one. n 1625 d'Artagnan, a poor young nobleman leaves his family in Gascony and travels to Paris with the intention of joining the Musketeer of the Guard.However, en route, at an inn in Meung-sur-Loire, an older man derides d'Artagnan's horse and, feeling insulted, d'Artagnan demands to fight a duel with him. The older man's companions beat d'Artagnan unconscious with a pot and a metal tong that breaks his sword; his letter of introduction to Monsieur de Trville, the commander of the Musketeers, is stolen. D'Artagnan resolves to avenge himself upon the man, who is later revealed to be the Comte de Rochefort, an agent of Cardinal Richelieu, who is in Meung to pass orders from the Cardinal to Milady de Winter, another of his agents.In Paris, d'Artagnan visits de Trville at the headquarters of the Musketeers, but the meeting is overshadowed by the loss of his letter, and de Trville refuses his application to join. From de Trville's window, d'Artagnan sees Rochefort passing in the street below and rushes out of the building to confront him, but in doing so he separately causes offense to three of the Musketeers, Athos, Porthos, and Aramis, who each demand satisfaction; D'Artagnan must duel each of them in turn that afternoon.